Nicola Marter was born with a gift. When she touches an object, she sometimes sees images; glimpses into its past, and of those who have owned it before. Born with this rare ability, Nicola sees it as something to keep hidden. But when a young woman arrives at the London gallery Nicola works at, offering a wooden carving for sale and claiming it belonged to Russia's Empress Catherine, Nicola faces a dilemma. 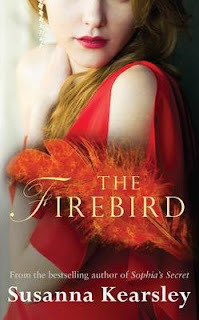 With no proof of its past, Nicola's boss believes the carving - known as 'the Firebird' - is worthless. But Nicola has held it, and she knows that the woman, who is in desperate need of money, is telling the truth. Compelled to help, Nicola turns to a man she once left, and still loves: Rob McMorran, whose own psychic gifts are far greater than her own. With Rob to help delve into the past, Nicola travels to Scotland to Belgium, and on to Russia. There in St. Petersburg, the once-glittering capital, Nicola and Rob unearth a tale of love and sacrifice, of courage and redemption - a story which will change their lives for ever. While this book begins with Nicola and Rob, it soon goes back in time to the story of Anna, daughter of Sophie and John Moray, from the book The Winter Sea. Rob and soon Nicola are able to tap into the past to Jacobite times, and 'see' Anna's story. She is whisked away one day from the household where she has been placed and is taken for safety to Belgium and into the care of nuns. Colonel Graeme and Mr Jamieson leave her there and promise one day to come back for her. My favourite part of the book is in this section, where Anna and Captain Jamieson are in front of her father's memorial stone. I was very touched by this little segment. Later, as I read the final pages I thought back to this segment, and realised the full import of it. Anna then through a series of events finds herself in Russia after she is helped by Captain Gordon. We now find Anna a young woman, no longer the child of Belgium. She is still courageous, loyal and ready to go out on a limb for what she believes in. She meets a young man who becomes very important to her. The final pages of the book bring all kinds of resolution - some I must say I did not see coming. I found that Nicola and Rob's story became of less importance to me as the book went on. I was caught up in Anna's story, and sometimes resented being dragged from it, back into the contemporary world. The story was full of detail and the descriptions were excellent. I was sorry that it was a year since I had listened to the audio of The Winter Sea, as I had forgotten small bits, that if I had remembered them, I would have been more 'on the ball' as to what was happening. I was delighted to find this book at our library. It was so new, I suspect I was the first reader of this beautiful hardback. Great feeling! I love the cover on your version. I liked this book as well, Susanna has quickly become one of my favorites. Have to agree, this cover has such a luscious red. I love it too.